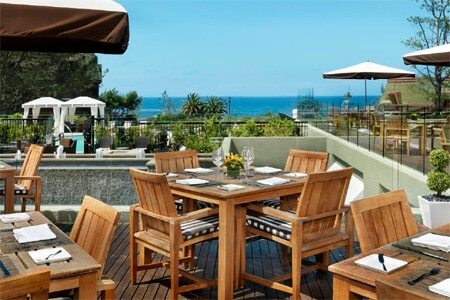 Ocean-view, sophisticated dining on the patio of L'Auberge Del Mar. : The back patio of L'Auberge Del Mar has long been a favorite spot for casual bites, cocktails and leisurely afternoons. And, now, there's food that's on par with the setting. Coastline boasts a compelling casual-gourmet menu. Savory breakfast means egg white frittatas with roasted artichokes, heirloom tomatoes, goat cheese and wild arugula, or a crab Benedict on focaccia with asparagus, roasted tomato and lemon hollandaise. For those craving a sweeter start, a Belgian waffle with lemon curd, blackberries and powdered sugar is a nice choice. Mimosas and Bloody Marys turn the breakfast into brunch on any given day. The all-day offerings are seafood-centric utilizing mostly seasonal produce. The farmers market flatbread rotates with combos like Valdeon blue cheese, broccolini, arugula and pickled peppers. Dishes include caramelized scallops on yellow curry rice or rock shrimp nestled on a bed of ginger and seaweed salad. Blackened shrimp tacos with corn and chili salsa and the mussels with chorizo bathed in tequila and lime nod to nearby Baja California. Lobster rolls, juicy burgers and oysters on the half shell round out the line-up. We like the pie-in-a-jar desserts with graham cracker crumble. Local craft beers, handcrafted cocktails and a solid sparkling wine list add to the fun.